How do you act when you have your plans for life all laid out and then a wrench is thrown into your plans? What do we do when God is the one who threw the wrench? Maybe you planned to be married by this stage of life and you’re not married yet. Or maybe you planned to have kids by now and you don’t have them yet. Maybe you are looking for a job and no potential employers are returning your calls. What are we to do? The Apostle Paul, as godly as he was, had his plans thwarted. Everything did not go as planned for Paul. He was beaten, imprisoned and eventually killed for preaching the gospel. Through all of his hardships he had a deep joy that no amount of suffering could touch. He had a suffering life, yet he had a joyful life! How can we live the life of joy, especially when things don’t go our way? During one of Paul’s many imprisonments he writes, “To live is Christ, to die is gain” (Phi. 1:21). This is a classic verse and a window into Paul’s thinking. When we pursue Christ His joy grows in us more and more. Do you want to be a person of joy? I hope so. Through the book of Philippians we will see how to grow in joy. 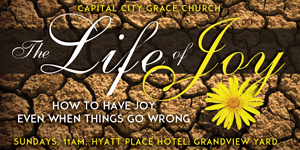 Join us this Sunday, 11am at Hyatt Place Hotel as we continue this series going through the book of Philippians and learning together how to live the life of joy!